Two and a half hours, culinarily speaking, isn’t such a long time. In 2.5 hours, a cook can go from flour to sandwich loaf; from roux to finished gumbo; from milk to ice cream. Until yesterday, I thought that pit-cooked* pork ribs fell well outside this time window. I was wrong. See, traditional pork ribs take around 4 hours of cooking, low and slow, at 225 to 250 degrees, with a mop of apple cider vinegar or other liquid every 30-45 minutes. This process isn’t technically difficult, it’s just a bit tedious, and it certainly doesn’t fit into a post-workday evening meal schedule. Hence the barbecued rib’s association with holidays, picnics, tailgates, and other leisurely pursuits. But what if you could reasonably cook ribs on a weekday evening? Now that slightly cooler temperatures have arrived, you might actually enjoy an evening outdoors tending the grill. Enter the turbo rib: from fridge to table in 2.5 hours (pictured above). 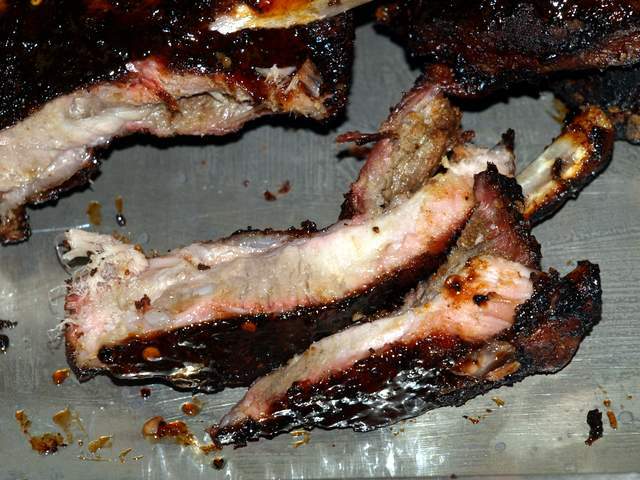 Start off with St. Louis style (aka trimmed) spareribs, remove the membrane (learn how here). Set up your grill for indirect heat and light the fire. In my Big Green Egg, this means a platesetter, legs up, then a drip pan (really just a sheet of foil with a folded-up rim), with the cooking surface on top. Stabilize the grill’s temperature at 325 to 350 degrees. Put on the ribs, bone side down. Close the lid. Don’t bother ribs for an hour, though do monitor the temperature. Wait another hour. 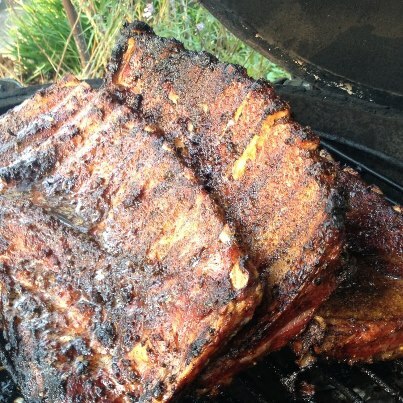 The ribs are done when the meat shrinks away from the bone and the rack easily bends in half. If you like, baste lightly with your favorite sauce and give ’em a few more minutes to glaze. Remove from the pit and tent with foil for 15 to 20 minutes before serving. The higher temperature (350 vs the usual 225) and shorter cook time yield a slightly chewier rib than “fall off the bone”, but chewy doesn’t mean tough. The turbo rib is toothsome rather than meltingly soft, and the preparation and method are definitely simple enough for a weeknight cook. Another bonus: this low-maintenance method allows you to cook side dishes, fold the laundry, mow the lawn, or watch back-to-back episodes of NOVA while the ribs cook. So get outside and enjoy “real” grilling season in the Deep South, and feel grateful that you’re not looking for your snow shovel or trying to find a place to store your grill for the “off season”. *If you pressure cook your ribs or bake them in the oven under barbecue sauce in under 2 hours, I don’t want to hear about it. They’re not barbecued ribs if live fire isn’t involved. And I understand that proposing a 2.5 hour, after-work meal makes me the Anti Rachel Ray. But not all delicious things can be accomplished in 30 minutes. Take your ADD meds and try the recipe anyway. While at Rouse’s yesterday morning I picked up a rack(yeah, I know butthat’s not much it was something I just wanted to try them)Swifts Premium pre seasoned ribs. I was going to throw them on with a pastrami I’m smoking tomorrow but I just might have to try the Turbo method. Sounds pretty good for when you want ribs and want them fast. Mmm I will take pastrami over ribs any day! Looks tasty. I can get baby backs down to about 3 hours, but I foil them for part of the cook. Your way looks like a lot less work. I like turbo beef ribs but so far still prefer my pork ribs low and slow, but that might just be the old coot in me, ha ha.